Absolute magnitude is the measure of intrinsic brightness of a celestial object. It is the hypothetical apparent magnitude of an object at a standard distance of exactly 10 parsecs (32.6 light years) from the observer, assuming no astronomical extinction of starlight. This places the objects on a common basis and allows the true energy output of astronomical objects to be compared without the distortion introduced by distance. As with all astronomical magnitudes, the absolute magnitude can be specified for different wavelength intervals; for stars the most commonly quoted absolute magnitude is the absolute visual magnitude, which uses only the visual (V) band of the spectrum (UBV system). Also commonly used is the absolute bolometric magnitude, which is the total luminosity expressed in magnitude units that takes into account energy radiated at all wavelengths, whether visible or not. The brighter the celestial object the smaller its absolute magnitude. The magnitude scale extends downward through the positive numbers and into the negative numbers as brightness increases. A difference of 1.0 in absolute magnitude corresponds to a ratio of 2.512 ≈ 100.4 of absolute brightness. 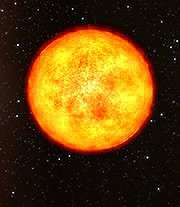 Therefore, a star of magnitude −2 is 100 (or 2.5125) times brighter than a star of magnitude +3. The Milky Way, for example, has an absolute magnitude of about −20.5, so a quasar with an absolute magnitude of −25.5 is 100 times brighter than the Milky Way. If this particular quasar and the Milky Way could be seen side by side at the same distance of one parsec and the Milky Way's stars reduced to a single point, the quasar would be 5 magnitudes (or 100 times) brighter than the Milky Way. Similarly, Canopus has an absolute visual magnitude of about −5.5, whereas Ross 248 has an absolute visual magnitude of +14.8, for a difference of about 20 magnitudes, i.e. Canopus would be seen as about 20 magnitudes brighter; stated another way, Canopus emits more than 100 million (108) times more visual power than Ross 248. In stellar and galactic astronomy, the standard distance is 10 parsecs (about 32.616 light years, 308.57 petameters or 308.57 trillion kilometres). A star at 10 parsecs has a parallax of 0.1″ (100 milliarcseconds). Galaxies (and other extended objects) are much larger than 10 parsecs, their light is radiated over an extended patch of sky, and their overall brightness cannot be directly observed from relatively short distances, but the same convention is used. A galaxy's magnitude is defined by measuring all the light radiated over the entire object, treating that integrated brightness as the brightness of a single point-like or star-like source, and computing the magnitude of that point-like source as it would appear if observed at the standard 10 parsecs distance. Consequently, the absolute magnitude of any object equals the apparent magnitude it would have if it were 10 parsecs away. Many stars visible to the naked eye have such a low absolute magnitude that they would appear bright enough to cast shadows if they were at 10 parsecs from the Earth: Rigel (−7.0), Deneb (−7.2), Naos (−6.0), and Betelgeuse (−5.6). For comparison, Sirius has an absolute magnitude of 1.4, which is brighter than the Sun, whose absolute visual magnitude is 4.83 (it actually serves as a reference point). The Sun's absolute bolometric magnitude is set arbitrarily, usually at 4.75. Absolute magnitudes of stars generally range from −10 to +17. The absolute magnitudes of galaxies can be much lower (brighter). For example, the giant elliptical galaxy M87 has an absolute magnitude of −22 (i.e. as bright as about 60,000 stars of magnitude −10). where the insignificance of extinction by gas and dust is assumed. In August 2015, the International Astronomical Union passed Resolution B2 defining the zero points of the absolute and apparent bolometric magnitude scales in SI units for power (watts) and irradiance (W/m2), respectively. Although bolometric magnitudes had been used by astronomers for many decades, there had been systematic differences in the absolute magnitude-luminosity scales presented in various astronomical references, and no international standardization. This led to systematic differences in bolometric corrections scales, which when combined with incorrect assumed absolute bolometric magnitudes for the Sun could lead to systematic errors in estimated stellar luminosities (and stellar properties calculated which rely on stellar luminosity, such as radii, ages, and so on). For planets and asteroids a definition of absolute magnitude that is more meaningful for nonstellar objects is used. In this case, the absolute magnitude (H) is defined as the apparent magnitude that the object would have if it were one astronomical unit (AU) from both the Sun and the observer. Because the object is illuminated by the Sun, absolute magnitude is a function of phase angle and this relationship is referred to as the phase curve. To convert a stellar or galactic absolute magnitude into a planetary one, subtract 31.57. A comet's nuclear magnitude (M2) is a different scale and can not be used for a size comparison with an asteroid's (H) magnitude. The absolute magnitude can be used to help calculate the apparent magnitude of a body under different conditions. Actual value: −12.7. A full Moon reflects 30% more light at full phase than a perfect diffuse reflector predicts. ↑ Casagrande, L.; Portinari, L.; Flynn, C. (November 2006). "Accurate fundamental parameters for lower main-sequence stars". MNRAS (Abstract). 373 (1): 13–44. Bibcode:2006astro.ph..8504C. doi:10.1111/j.1365-2966.2006.10999.x.